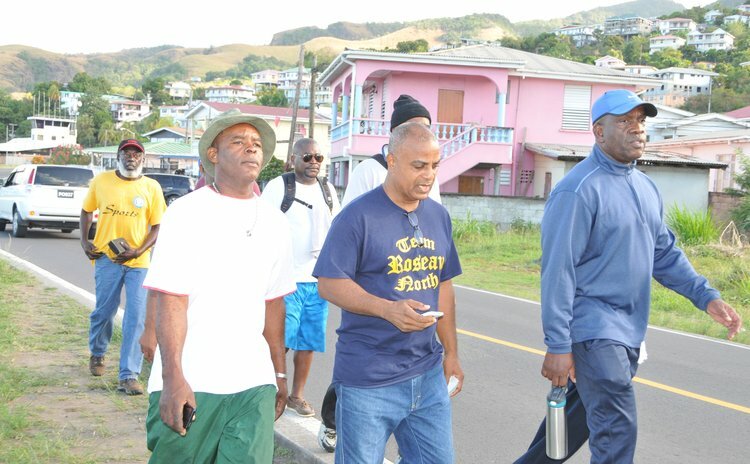 Lennox Linton, the Leader of the Opposition led a protest walk of about a dozen persons from Layou to Roseau on February 23. The march led up to the payment that Lennox Linton owed to Chattered Accountant Kieron Pinard-Byrne. Linton lost a court case against Pinard-Byrne which ended at the Privy Council in 2015. In 2013 Linton accused Pinard-Byrne of inappropriate behaviour in executing his jo as owner representative, secretary and accountant in the ill-fated Layou River Hotel economic citizenship programme. Following the protest walk, Linton along with his supporters gathered outside the lawyer offices of De Freitas De Freitas and Johnson where they prepared to make their contributions. The Privy Council earlier ordered Linton to pay £20, 000 to Pinard-Byrne which covered Byrne's cost at the final appellate court. This was Linton's second payment to Pinard-Byrne. In January Linton paid about EC $80 000 for damages, cost of legal services and interest in the High Court leg of the libel case. "This is an important occasion for us we are continuing the process of making the payment that the court has ordered and over the next few hours we will each and every one of us with our contribution," said Linton on Tuesday surrounded by his supporters outside the law office of De Freitas De Freitas and Johnson. "I thought it was really important to go to Layou this morning because this is Black History Month and there is an important part of history that is at Layou that we ought not to forget," he said.